These two new storage solutions use quad-core Intel Celeron processors and offer support for virtualization, encryption, transcoding and HDMI output. QNAP Systems announced yesterday the release of two new storage solutions for small businesses. The 2-bay TS-251+ and the 4-bay TS-451+ are both powered by a quad-core Intel Celeron processor and promise to deliver "an uncompromising high-performance and scalable storage solution" for an affordable price. The features of these two new QNAP Turbo NAS solutions include virtualization, advanced backup, AES 256-bit encryption, real-time and offline video transcoding, HDMI video playback (a remote control is also included), and more. Their specs include a 22 nm 64-bit quad-core Intel Celeron processor, 2 GB/8 GB DDR3L RAM, Gigabit LAN connectivity, as well as two USB 3.0 and two USB 2.0 ports. The TS-251+ and TS-451+ have a scalable design that supports storage capacity expansion of up to 96 TB by connecting a QNAP UX-800P or UX-500P enclosure. The TS-251+ and TS-451+ run QTS 4.2 and can be already acquired from QNAP retailers online and offline, including Amazon, NewEgg, Best Buy, and more. For more details, please check the press release below. 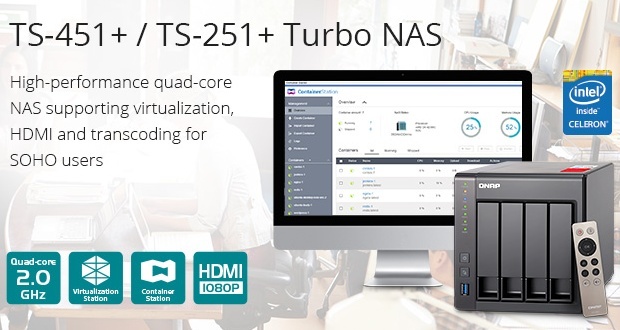 Taipei, Taiwan, November 10, 2015 - QNAP® Systems, Inc. today announced the release of the quad-core 2-bay TS-251+ and 4-bay TS-451+ NAS that provide an uncompromising high-performance and scalable storage solution for small offices and workgroup users with appealing affordability. The new models feature virtualization readiness, containerized applications, advanced backup solutions, real-time & offline video transcoding, QvPC Technology, HDMI video playback with an included remote control, and many more functions that are beneficial for businesses and SOHO users to build a cost-efficient and modern storage solution. The new NAS series runs QTS 4.2, a smart NAS operating system that comes with a variety of features to empower offices and home applications. Users can run multiple applications on Windows®, Linux®, UNIX® and Android™ based virtual machines on the NAS with the Virtualization Station, and operate multiple isolated Linux systems on the NAS. The Container Station integrates LXC and Docker® lightweight virtualization technologies and allows apps to be downloaded from the built-in Docker Hub Registry®. Not limited to high-end models, the TS-x51+ includes the highly-anticipated snapshot function (a minimum of 4GB RAM is required). The QTS Storage Manager can easily create snapshots within seconds for both volumes and LUN, and users can also carry out snapshot replica and cloning tasks. The NAS series also offers flexible backup solutions for Windows and Mac® and disaster recovery solutions with Real-Time Remote Replication (RTRR), rsync and cloud storage backup. Users can easily operate the TS-251+ and TS-451+ as a PC with QvPC Technology. By simply plugging in a keyboard, mouse and HDMI display, users can directly access stored data, run multiple virtual machines, surf the web, enjoy 1080p videos with the included remote control and up to 7.1 HD audio with Kodi™, monitor live feeds on Surveillance Station, and much more. The NAS also supports excellent real-time and offline transcoding capabilities as well as streaming photos, music and videos to different rooms from a single device using Bluetooth®, USB devices, HDMI, DLNA®, Apple TV® and Chromecast™ as a multi-zone control system. The TS-x51+ is ideal for organizations to build a secure private cloud with numerous offerings, including cross-platform file sharing for Windows, Mac, Linux and UNIX users; support for Windows® AD, LDAP directory services and Windows® ACL; VPN server with L2TP/IPsec, OpenVPN, and PPTP support; 2-step verification; encrypted access, and more. Today’s businesses are also demanding economical solutions that provide flexible storage scalability for rapid data growth. The TS-x51+'s scalable design supports online capacity expansion by connecting a QNAP 8-bay UX-800P or 5-bay UX-500P expansion enclosure to provide a total capacity of up to 96TB. Quad-core Intel® Celeron® 2.0GHz processor (burst up to 2.42GHz), 2GB or 8GB DDR3L RAM (expandable up to 8GB); hot-swappable 3.5”/2.5” SATA 6Gbps HDD/SSD; 2 x USB 3.0, 2 x USB 2.0; 2 x Gigabit LAN ports; 1 x HDMI output. The new TS-251+ and TS-451+ NAS are now available. For more information of these new products and the full QNAP Turbo NAS lineup, including where to buy, please visitwww.qnap.com.